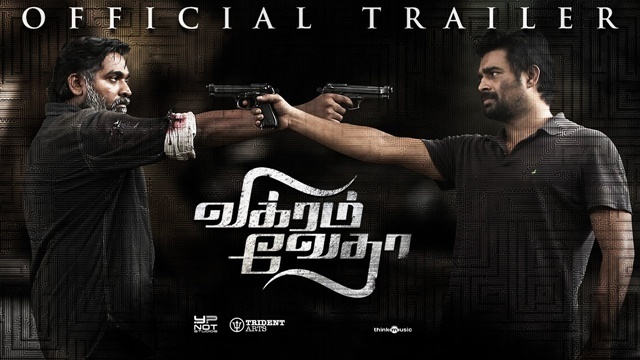 To make it more exciting, the makers of Vikram Vedha convinced Bollywood Super Star Shah Rukh Khan to release the trailer.The baadshah obliged to it and released the trailer on his social networking page and wrote – “To all my Tamil friends here’s the dynamic trailer of my friend Maddy’s film #VikramVedha @ActorMadhavan @sash041075.”Watch Vikram Vedha Tamil Movie Official Trailer now Youtube. The Film ft. R Madhavan and Vijay Sethupathi on Y NOT Studios. Vikram Vedha is directed by Pushkar and Gayatri. Music composed by Sam C S and produced by Sashikanth under the banner Y NOT Studios. Vikram Vedha Tamil Movie also features Varalakshmi, Shraddha Srinath, Kathir. The Vikram Vedha trailer was released on social media by Shah Rukh Khan and Sivakarthikeyan amidst much hype. Vikram Vedha seems to have Madhavan playing a shoddy Cop while Vijay Sethupathi seems to be playing a criminal.Both these actors look ruthless in their characters which ooze of wrongdoing. The Vikram Vedha Story seems to be revolving around these two men and how they counter each other when their paths cross. Tags: Vikram Vedha Tamil Movie Official Trailer, R Madhavan, Vijay Sethupathi, Y Not Studios, Vikram Vedha, Vikram Vedha Official Trailer, Vikram Vedha Trailer, Vikram Vedha Movie Trailer, Vikram Vedha Tamil Trailer, Vikram Vedha movie, Vijay Sethupathi movies, Varalakshmi, Shraddha Srinath, Kathir.